James E. Cherry is the author of a poetry chapbook, two full collections of poetry, a collection of short fiction and two novels. His novel, Edge of the Wind, was a 2016 Foreword Review Book of the Year Finalist for Fiction. 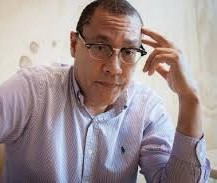 He has been nominated for an NAACP Image Award, a Lillian Smith Book Award and was a finalist for the Next Generation Indie Book Award. Cherry has an MFA in creative writing from the University of Texas at El Paso and resides in Jackson, Tennessee where he is Artist in Residence with an after-school program for at-risk youth.